Product prices and availability are accurate as of 2019-04-14 02:30:28 BST and are subject to change. Any price and availability information displayed on http://www.amazon.co.uk/ at the time of purchase will apply to the purchase of this product. 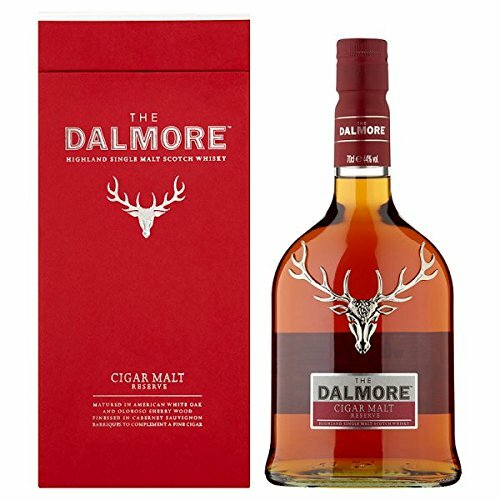 The Dalmore Cigar Malt Reserve benefits from a judicious selection of aged stocks drawn from casks of three types: American white oak ex-bourbon casks, 3 year old Matusalem oloroso sherry butts and premier cru Cabernet Sauvignon wine barriques. Bottled at 44% alcohol by volume, the body, structure and character of this extraordinary expression is the perfect complement to a fine cigar. 1263 The Dalmore's heritage dates back to 1263, when an ancestor of the Clan Mackenzie, owners of The Dalmore distillery for over a century, saved King Alexander III from the fury of a charging stag. In recognition of this noble act the grateful King granted the Clan Mackenzie the right to use a 12-point stag, representing a 'Royal', in their coat of arms. This striking icon has since adorned each bottle of The Dalmore, symbolising The Dalmore distillery's regal legacy. The Art of The Dalmore The Dalmore is crafted using a 15 year old artisan process passed down through the generations. Eight hand beaten copper stills of variable shape and size deliver a full flavoured and complex new spirit, which is then enriched over the years in the finest American white oak ex-bourbon casks and hand selected oloroso sherry butts. Master Distiller Richard Paterson then makes his final selection, harmonising the spirit of the chosen casks in bespoke sherry butts until he decides that the precious contents are ready for bottling.